The 2014 SUGAR Group House Party RRRoundup! Yes, you read that right. This year’s RRRoundup is just around the corner and this year the SUGAR Group is shaking things up. Instead of having one location for a large gathering, this year we are using our webcast service to link together smaller house party locations from across the U.S. 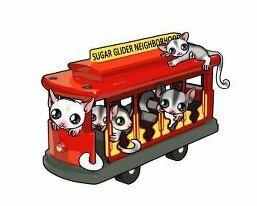 This will be an exciting event, and allows us to have speakers and demonstrations and such from some knowledgeable owners/breeders/vendors/rescuers/scientists who otherwise could not make the event while still ensuring that attendees are gathering with other sugar glider lovers for fun and fellowship. You will have the opportunity to attend a house party within driving distance of your home location OR to join us via the live webcast from the comfort of your own home. There is no reason for you to miss this spectacular event this year! As always, we will be releasing more and more details in the coming weeks as things get confirmed and set in stone. However, we wanted to get the word out so that you all can begin planning for how you might participate in the event this year. Amarillo, TX / Texas panhandle - Hostesses Chris Reams and Val Betts - Location: address to be given to registered attendees only. Additional locations to be announced as confirmed. ** If you are interested in hosting a house party in your area AND believe you can gather a group of at least 6 people for the event, then please contact Val Betts (Something_To_Believe_In ) for additional information. In the coming weeks, we will be releasing site specific information for each house party. While the information presented and some of the activities will be the same, each location will also be unique in their personality and social activities. We are going to have a great deal of fun in the weeks leading up to this event as well! Registration will open some time in the next 2 weeks, so keep an eye on this thread for more information and updates! We can’t wait to see you on March 1st!!!!! All Registration fees must be paid in full prior to the event. Though we can accept registration paid at the door, we cannot guarantee meals for those who do not pay prior to Feb. 26. * Ability to participate in our online "after party" Saturday night following the event. Due to the logistics of this event, we will NOT be able to accept registration to participate online after Feb. 25, 2014. You MUST register and PAY IN FULL prior to Feb. 25, 2014 to participate live online. Vendor registration is FREE again this year for paid registrants. Space is limited, so will be on a first come/first served basis. We DO need you to register that you intend to vend, so please fill out the vendor registration form on the SUGAR Group website. Please be aware that the details specific to each site hosting a house party will be posted on The Sweet Spot at http://thesweetspot.forumotion.net/t2456-house-party-site-specific-information and on The SUGAR Group website at http://www.sugargroup.org/2014-RRRoundup-Information.html. Please check out those pages for more detailed information on each location. Hope to see you all there! * Donation to the "door prizes" and auctions for those participating from home. Gift certificates are acceptable as are actual prizes. We will put together several auction packages again this year and will also offer a few door prizes. So, anything is game here. ANY item that you have to donate can fall in this category. * Donation of supplies for the event - pens, pocket folders, break treats, copy paper, etc. are all needed. If you wish to donate in this manner, PLEASE contact Val prior to purchase so that she can ensure we don't get hundreds of the same thing. * Gift bag donations - 60 of an item for the gift bags. Again, these will be divided out and sent to each home so that all paid participants receive these items. This year, we are making a special offer to our friends who donate. So, any vendor who donates at least TWO items may participate in our “Swap Shop.” We will take your pre-made items and distribute them to the various locations where they will be available for sale to the participants in that home. This will allow you to make your items available to potential customers all throughout the U.S. (Austin, Amarillo, Detroit, Chicago, Northern Colorado, and MD/VA/DC). It will also allow us to provide a wider variety of products to the small groups gathered at each of these locations. • You may send a small number of items for the 6 homes participating. Please do not send more than 40 items TOTAL. You will only have to ship them once – To Val’s house – and we will distribute them to each home. Think a “sampling” of your items – 5 or so per home should suffice. • Please be sure that items intended for the SWAP SHOP are clearly labeled as such with your business card and a price attached to each item. • Please be aware that the cost of shipping unsold items back to you will be taken out of the sales income made from selling your items. If NONE Of your items sell, then you will be responsible for the cost of shipping them back to you. Your local house party hostess will have more ideas for you at the time of the event to assist with increasing sales and with shipping costs. • Please send a list of items that you sent for sales so that we can account for all sales appropriately. • ONLY those vendors who donate TWO or more items to the event may participate. 1) ANYONE who donates will be listed and thanked in our program and on a special “thank you” page of the ads running during breaks on the webcast. ** Those who donate to any two of the above will receive a 1/8 page ad with their logo displayed. Please include your business card with each of your donations so that attendees will know where to go to order more! Subject: Re: The 2014 SUGAR Group House Party RRRoundup!